Camping in the wilderness is a good way to take a break from your busy life and enjoy natural beauty. While it’s not absolutely necessary, bringing along a couple of convenience items to improve your safety and overall comfort won’t hurt. 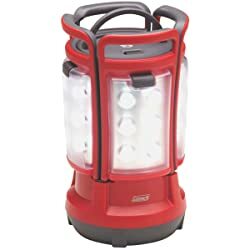 One notable example in the category would be the camping lantern which should come in handy when you need a lot of light. However, with so many brands and models around, it’s easy to get confused. In that case, this article could introduce to some of the best camping lantern along with their characteristics and reviews for your consideration. It’s very important to keep in mind that personal tastes and camping situation vary a lot from one case to the other. A single product could not satisfy the need and requirement of every camper so make your purchase carefully. Reviews and opinions are good references but you have to take into account all aspect of your trip as well. If you just rush to the counter, you could waste a lot of money on a product that you have little use for. That is why you should take some time to think about what you truly need before you head to the store. 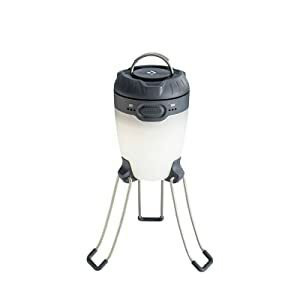 Small and sturdy, Streamlight The Siege is one the best camping lantern available for purchase. The lantern polycarbonate cover is removable and it’s able to provide 360-degree light distribution without compromising your night vision. There are D rings attached to the top and bottom of the lantern so you could set it up in anyway you like. For the power source, The Siege utilizes 3 D cell alkaline batteries which are sold separately. In term of endurance, the lantern possesses an IPX7 waterproof rating and a 2-meter impact resistance height. The lantern could actually float if you drop it in the water. Consist of 4 separate light panels on a lantern base, Coleman Quad LED offer its user a high degree of flexibility. You could remove the panels and use them as independent light sources if necessary, they should last for roughly an hour between recharges. The lantern is powered by several D-cell batteries which are large and heavy but they could sustain the lantern for a long time. These LED lights remain cool after hours of operation so you could touch them without getting burnt. Coleman Quad LED is backed by a generous 3-year limited warranty. Featuring EasyTrigger quick ignition system, Primus Micron offers you bright and adjustable light at moment notice. The lantern humble profile and lightweight mean its portability is excellent, you would have a hard time noticing the presence of Primus Micron. About the fuel, the lantern runs on Butane and it should be compatible with all standard gas canisters. 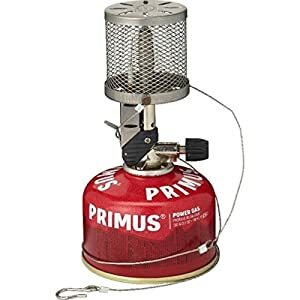 If needed, you could even buy a butane-to-propane adaptor which is available at most camping stores. Instead of glass, the Primus lantern employs a tough mesh globe so you don’t have to worry about accidental breakage. With up to 30 LED lights arranged in a circular fashion, Etekcity Portable LED clearly illuminate its surrounding. To power up the LED lights, the lantern requires a couple of AA batteries which you could find pretty much everywhere. Due to the use of ABS military grade plastic, the lantern is able to function reliably in harsh working condition. When not in use, you could collapse the lantern to save space which truly makes it a good choice for extended camping trips. The collapsible mechanism of the lantern also offers you a way to adjust the brightness of its light. 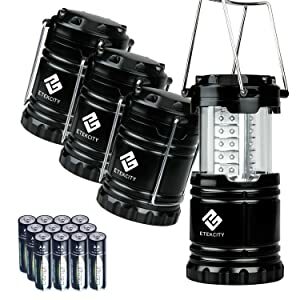 As a proof of the product quality, Etekcity back their lantern with a 10-year warranty and a 90-day refund guarantee. Well suited for a wide range of activities and purposes, Black Diamond Apollo is among the most versatile camping lanterns you can get. At 250 Lumens, the lantern is capable of helping you to set up your tent in the dark. The legs of the lantern allow it to be deployed on uneven grounds, you could also hang it on a slender tree branch. It has a convenient USB charging port so you are able to use the lantern to recharge your electronic devices. Generally speaking, Black Diamond Apollo is a good choice for backpacking and car camping but it would come in handy in power outages as well. Made from tough plastic and molded rubber, AYL StarLight is capable of matching a variety of camping setting. There is a foldable hook attached to the bottom lantern so you set it up in any manner you prefer. The StarLight convex reflector cap offers all-around illumination but if you need a focused beam, you could remove it. In term of setting, there are 3 modes: Low, High and Flashing. To change between the lighting modes, all you have to do is to cycle the switch button. 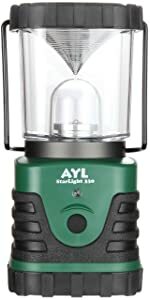 While you purchase the lantern D batteries separately, AYL StarLight is backed with a lifetime warranty.